Alert handlers and shippers to treat your static-sensitive materials with the extra care they require. 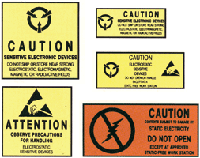 Each label's bright coloring will immediately warn handlers to keep your boxes, cartons or other containers away from electromagnetic or radioactive fields or areas that could harm them. Asterisked labels meet MIL STD-129L.